International Data Corporation (IDC) is the premier global provider of market intelligence, advisory services, and events for the information technology, telecommunications and consumer technology markets. IDC helps IT professionals, business executives, and the investment community make factbased decisions on technology purchases and business strategy. 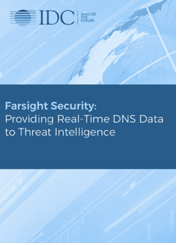 This IDC Vendor Profile analyzes Farsight Security's threat intelligence offerings and highlights the company's differentiation factors in the market. The IDC Vendor Profile reviews key success factors including strategy, offerings, partnerships, and target markets.